Robots protect every planet's natural state. First details from Game Informer’s No Man’s Sky cover story have come in. The game begins with a space trip similar to the end of 2001: A Space Odyssey. You appear on a random planet—different for every player—which might have tough creatures lurking, perhaps rare items, or might just be a boring and unexciting. Your mini-map displays an indicator that leads to your ship. The full map shows the entire galaxy, allowing you to zoom in and out at different levels and see stars up close. Star colors indicate which resources the planet has, and you can scan their solar systems to see if there is a space station or planet with points of interest. Previously explored planets will show exactly what’s on the planet. Though you’ll have access to your ship, you’ll need a new hyperdrive and fuel before you can go a significant distance. And to do this, you’ll need money. Everything you do deposits money into your bank account. Blowing up rocks to gather resources, destroying other ships, and discovering new areas all award the player with currency. Each solar system is equipped with a trading post or space station, where you’ll find ships entering and leaving, and where you can cash in resources for money, or buy new ships and upgrades. Every planet has a trading post so you won’t have to fly to space each time you want to cash in. Larger space stations will have better ships and upgrades to buy. And if it’s so desired, players can attack stations to lower its ranking (but no blowing it up). Outside of that, there aren’t any real rewards for attacking space stations. 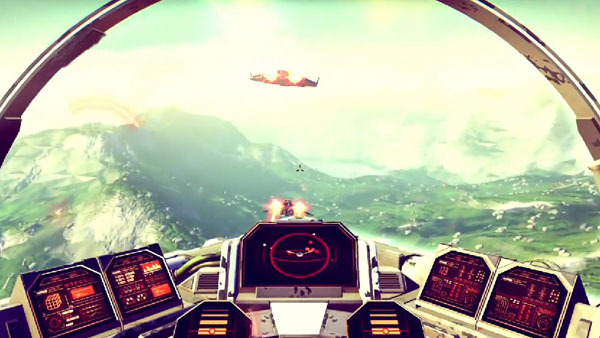 Players can also attack other ships via arcade-like first-person combat and steal their cargo. But doing so might alert the local police. If you’re able to escape, the police will have a bounty on you that won’t let you go around the base without getting attacked. In combat, you’ll need to determine which enemy to attack first: the smaller, easier ones, or the bigger, shielded elites. Some of the larger ships will shield the smaller ships, and some ships you won’t be able to take down unless your ship is upgraded the appropriate amount. It’s also possible to lose your ship during combat. If this happens, you’ll flee in an escape pod and land on the closest planet, losing what items you had on the ship, but keeping your personal upgrades and money. From here you’ll need to buy another ship. And if you die after landing, you’ll be taken back to the pod site and lose everything you’ve gathered since leaving the pod. Every planet has robots, of keepers of balance in the galaxy who were around before anyone can remember, that want to keep nature unharmed. The magazine shows bipedal and quadruped versions of these bots. Unlike the rest of the planet, they’re not procedural, so you’ll be able to learn how to deal with them. They won’t attack you if you’re just strolling along, but the more you mine for resources or kill alien creatures, the more they will attack you. The toughest robots can be found closest to the center of the galaxy. And that’s the main goal: to reach the center of the galaxy. But you don’t have to go there, if you don’t want to. But if you do want to, it’ll take a good 40 to 100 hours depending on how much focus you place on getting there. To help, some planets have portals that could randomly transport you closer to the center, but you won’t know what’s on the other side until you go through one. As far as multiplayer goes, there won’t be voice chat, but you’ll be able to see friends’ locations on the galaxy map, and some sort of in-game messaging system has been teased. The magazine also has a chart of possible upgrades for your suit, ship, and multitool, as well as things like shields, jet pack, armor, power, fuel capacity, hyperdrive, and the like. No Man’s Sky is planned for release on PlayStation 4. A new video will be shown at The Game Awards on Friday, and an entire event surrounding the game is planned for PlayStation Experience in Las Vegas this weekend. For more information and screenshots you can access now, pick up the January 2015 issue of Game Informer.